Yep you read it right. A stove and a grill. WOW!!!! If you read my initial review of the Biolite Stove, I was really impressed by it. These past months I was able to use the stove in my climbs and adventures. The excitement I felt when I got the stove and used it for the first time is still the same until now. Now let’s talk about the grill. 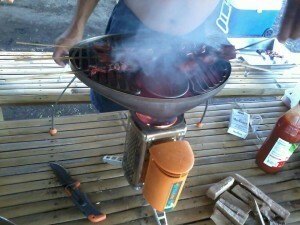 Biolite is so versatile and innovative that they made a matching grill to work with the stove. So now you get a charger powered by heat from biomass fuel, an environment friendly stove and a grill. The grill itself is made from stainless steel so there’s no question how durable it is. One thing that surprised me is how cheap it is to run. During SMB’s 9th Anniversary party we grilled 5 kilos of pork liempo and 60 sticks of isaw and guess what………… we only used several small pieces of dry wood which we gathered from our backyard. From my estimate 5 kilos of meat would have equated to 3-5 plastic bags of coal which we usually buy at around 10-15 pesos a bag. Now that is awesome right? And you save yourself from the harmful fumes of coal. One thing though, I would not recommend bringing the stove and grill together in a multi-day climb. It is heavy and will take a lot of space in your pack plus the dry wood. 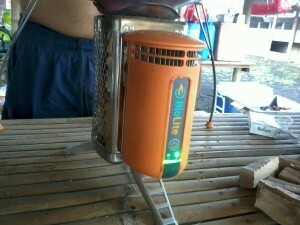 The Biolite Stove and Grill is great to use in day treks, outings and picnics. Kudos Biolite!!! This is one great gear in my arsenal. I love BIOLITE!!! For more information about Biolite please visit their website by clicking HERE.